In a small mixing bowl, tear white bread into pieces and pour ¼ cup of milk over the bread. Set aside. In a large sauté pan on medium heat, melt 1 tablespoon of butter and add ½ cup of finely chopped onions. Cook until onions are translucent in color and soft. Remove from heat and set aside. In a large deep bowl, combine the bread and milk mixture with ground beef/pork/veal, 2 egg yolks, ¼ teaspoon of salt, ½ teaspoon of black pepper, ¼ teaspoon of allspice, ¼ teaspoon of nutmeg, ½ teaspoon of dried dill and the cooked onions. Mix all until well combined. Using your hands, shape the meatballs into 1 inch rounds, place on sheet. It will make about 30 to 40 small meatballs. Heat remaining 2 tablespoons of butter in a sauté pan over medium low heat. Add meatballs and sauté until golden brown on all sides, about 7 to 10 minutes. 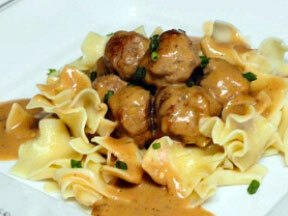 Using a slotted spoon, transfer the meatballs to an ovenproof dish and place in the warmed oven for about 20 minutes. Go back to the sauté pan, decrease the heat to low and add ¼ cup of flour. Whisk until lightly browned, about 1 to 2 minutes. Gradually add 3 cups of beef broth and whisk until sauce begins to thicken. Add ¼ cup of light cream, 1 tablespoon of sour cream and 1 tablespoon of mayonnaise and continue to whisk until well blended. Continue to cook until the gravy reaches the desired consistency. Remove the meatballs from the oven and pour in the gravy, stirring gently to cover all the meatballs. Serve with noodles and top with fresh chopped chives.